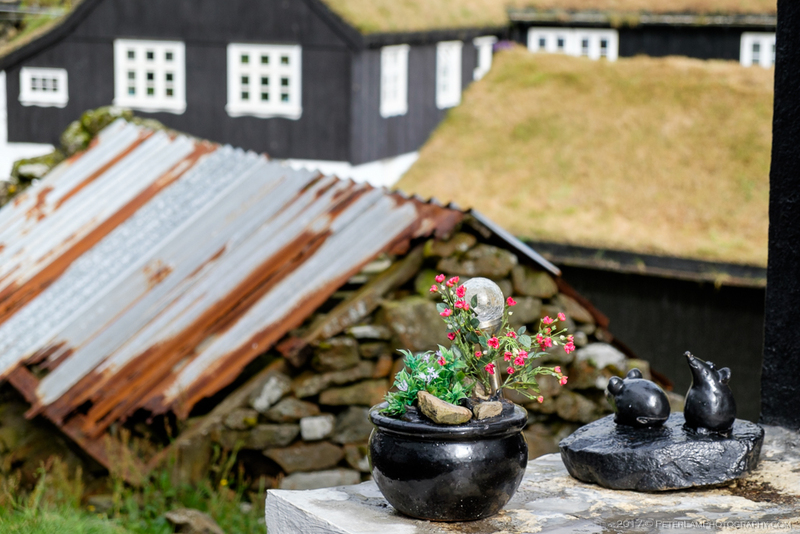 Much like the hike on Kalsoy island, any trip to the Faroe Islands isn’t complete without a visit to another popular destination – Mykines, the westernmost island of the country. 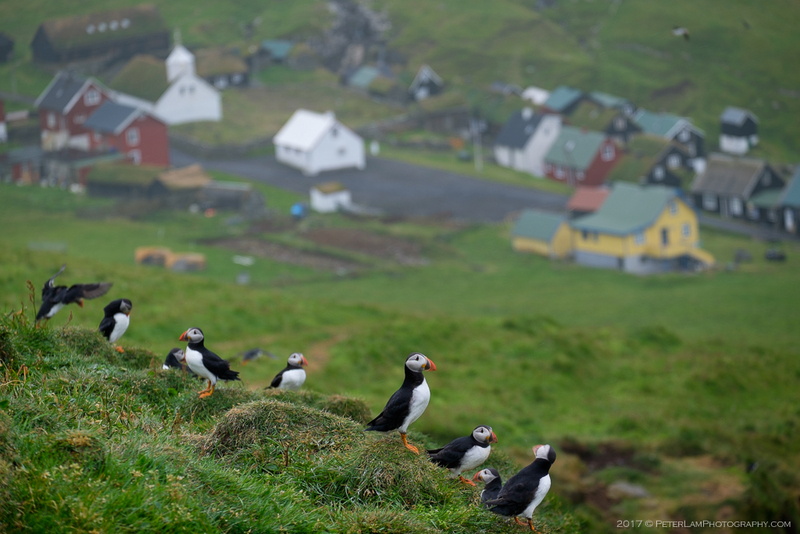 While the trek to the lighthouse here is just as spectacular as Kallur, the main draw of Mykines are the thousands of seabirds that call this island home – especially the puffin colonies near the islet of Mykineshólmur. 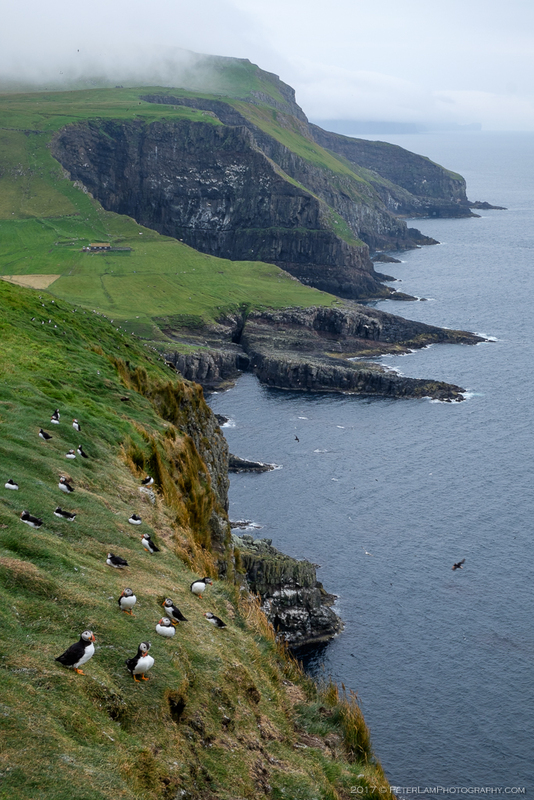 Mykines is in fact one of the most important bird habitats in the North Atlantic. 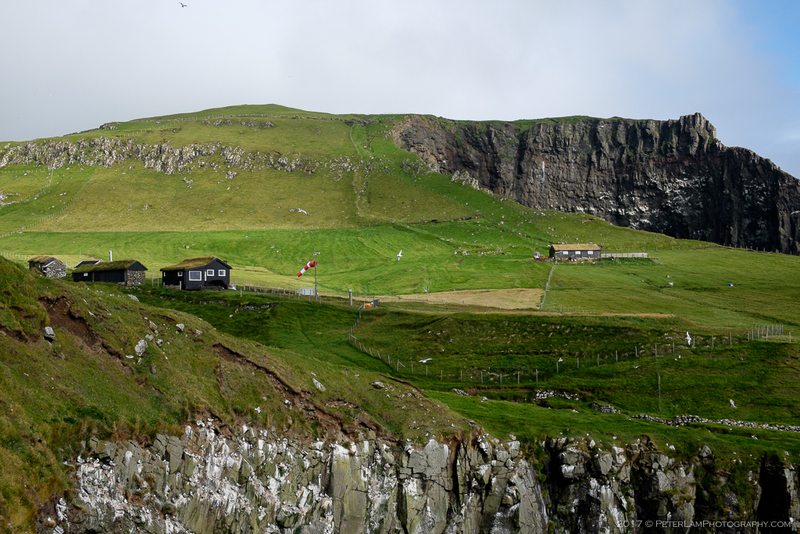 Mykines is one of the most isolated islands of the Faroes. 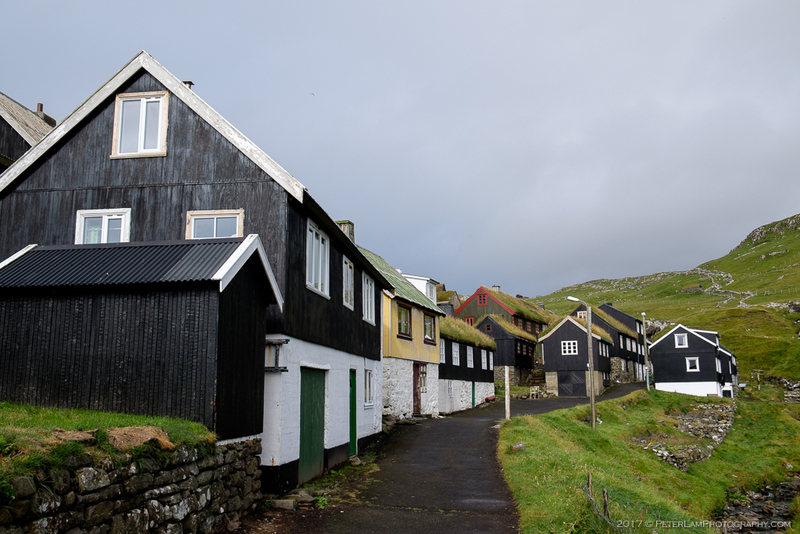 Its only settlement, Mykines village, is connected to the mainland by helicopter and a small ferry service, both of which require advance booking and whose operations are at the mercy of the country’s notoriously fickle weather. 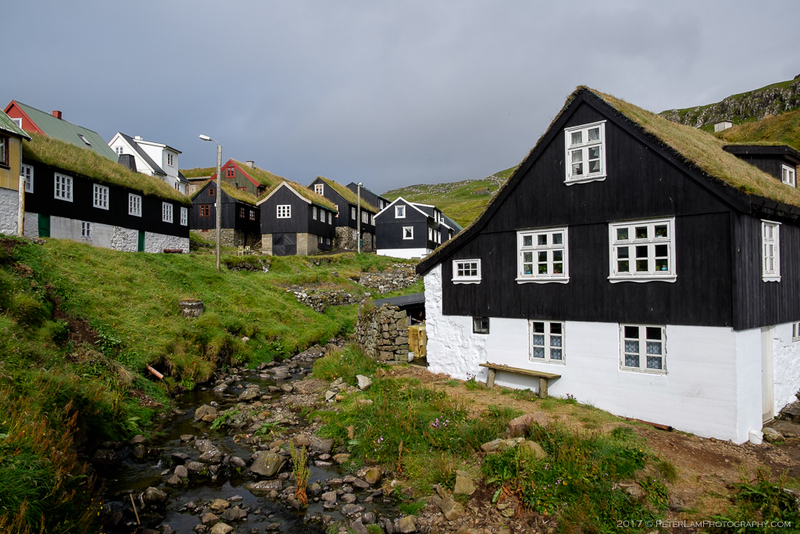 A day trip is a popular excursion, but you can also stay longer at one of the guest houses in the village (aka stranded due to inclement conditions). We pounced at the opportunity of a helicopter ride, and with a government-subsidized price of only $25 US per person, it’s a great deal! You’ll need to plan ahead, though – flights depart from Vágar airport only once a day, four days a week, and have a total of just 10 seats. 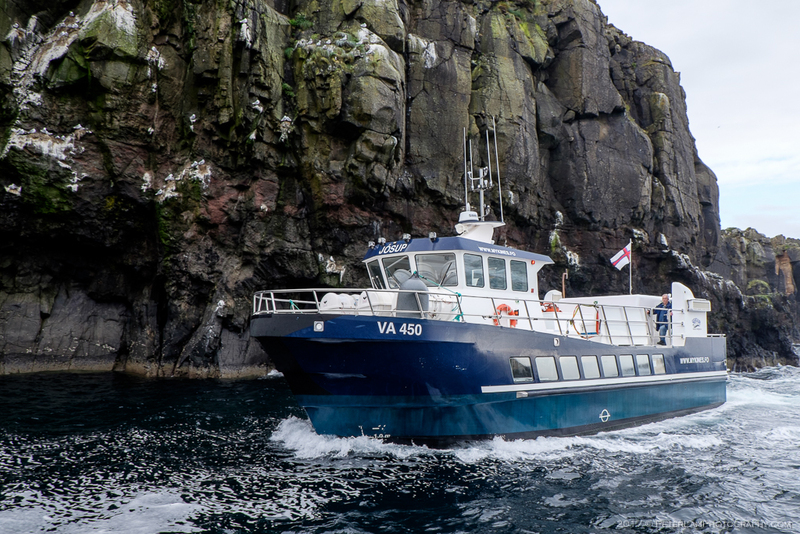 To return to the mainland, we booked the afternoon ferry from Mykines to Sørvágur on Vágar island. 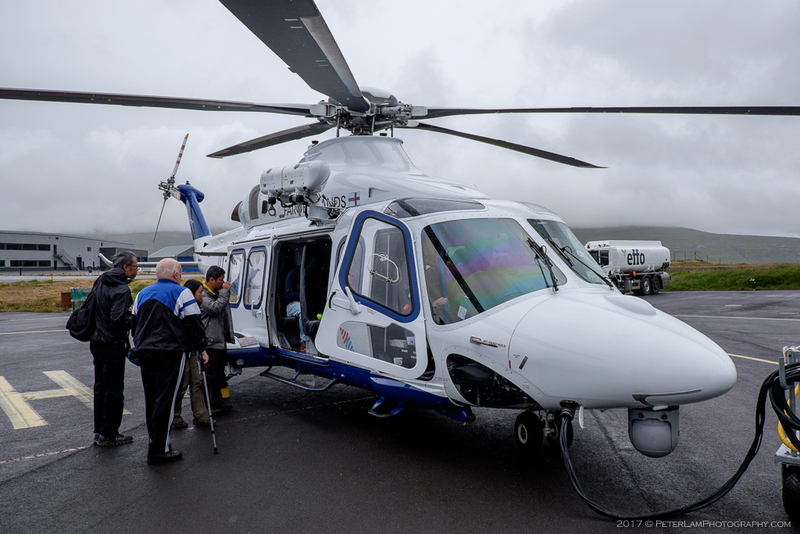 Boarding our helicopter ride at Vágar airport. 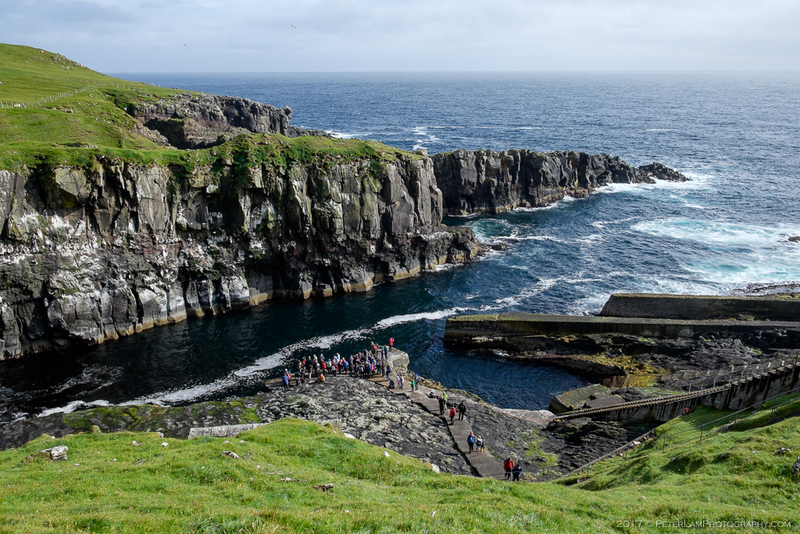 View of Mykines harbour from above. The helipad on the island. Service is run by Atlantic Airways, the national carrier. Unfortunately the weather didn’t cooperate this day, though I can’t really complain as we had seen very good conditions on our trip so far. 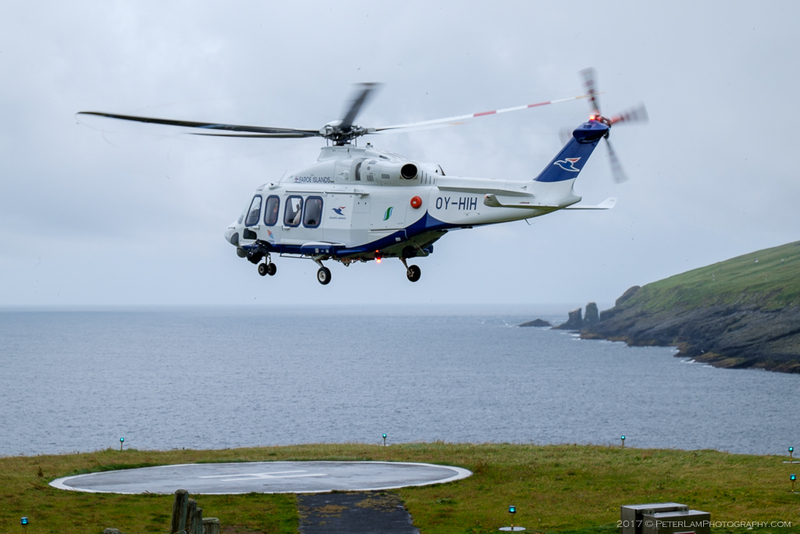 While the helicopter experience was great, the view from the air was non-existent as low cloud cover obscured most of the island. 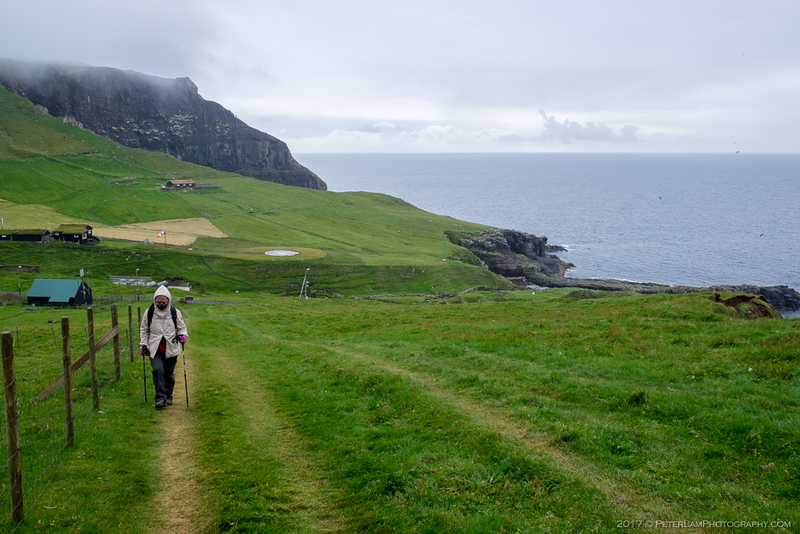 After a quick look around in Mykines village, we started the hike to the lighthouse on the western end just as a steady rain began falling. 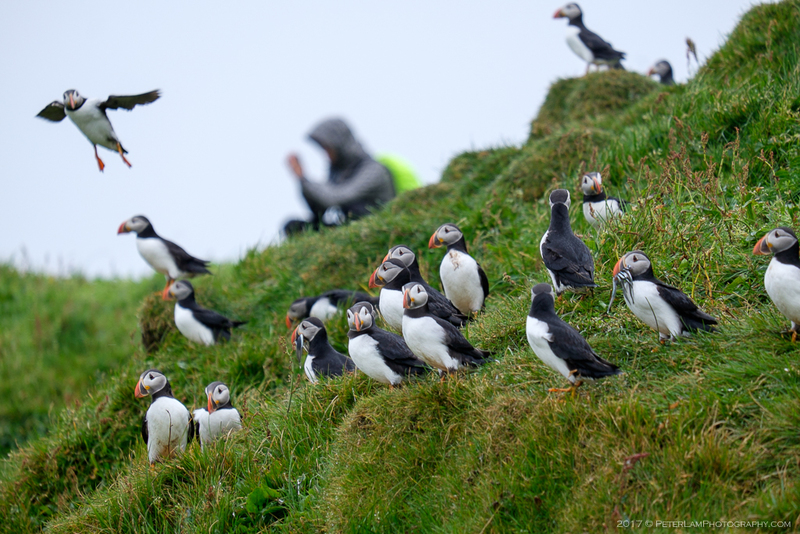 Soon we saw the first of many puffins nestled in burrows dotting the hillsides – hundreds upon hundreds of them, on the cliffsides and swarming in circles overhead. It was an unforgettable sight. Starting the hike up the hill from the village. You can get quite close to the birds and it doesn’t bother them at all. 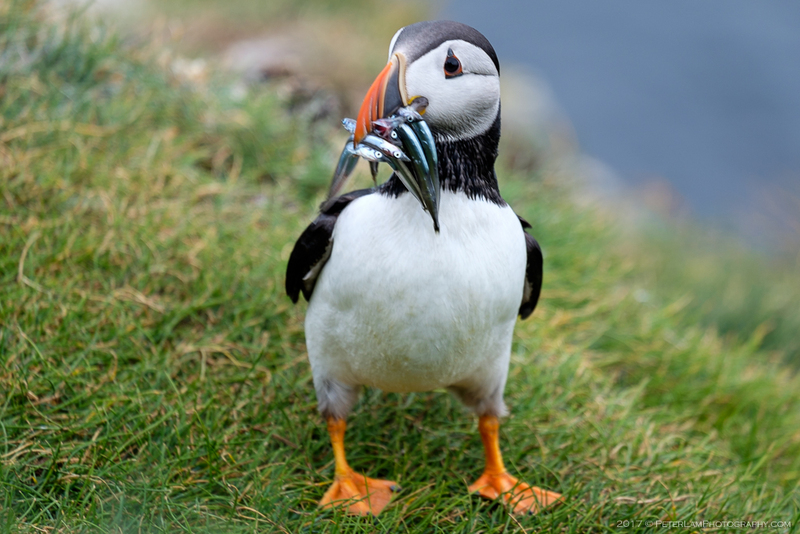 Returning from the ocean with the catch. On the trail, a memorial for those lost at sea. 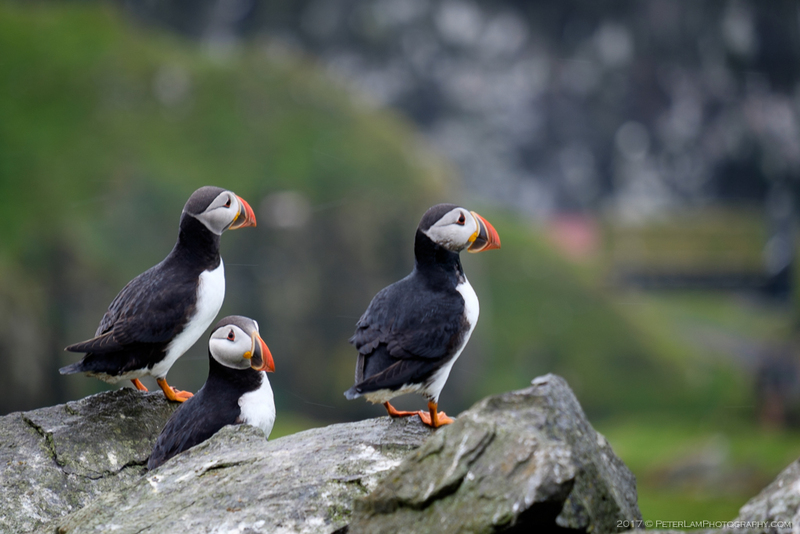 Perhaps the puffins have gotten accustomed to humans walking among them, as they didn’t seem bothered by the steady stream of hikers on the trail. I think they may have been as curious about us as we were about them! 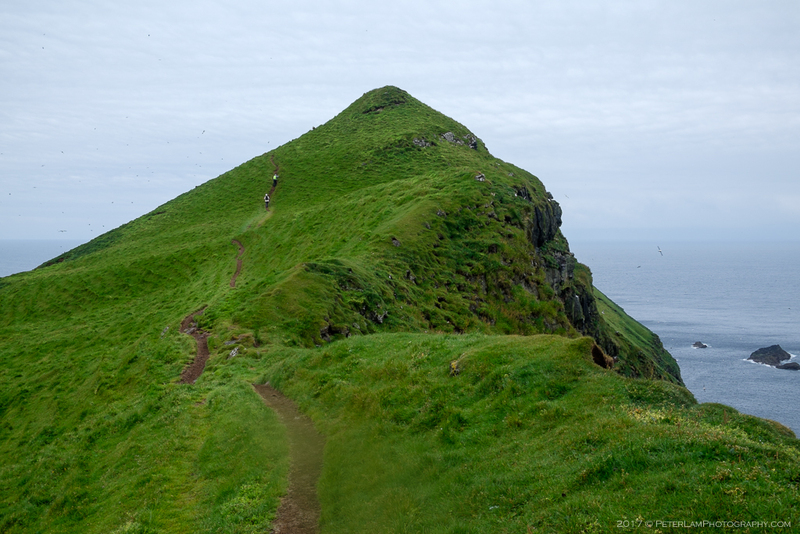 The trail continues higher to the westernmost point. 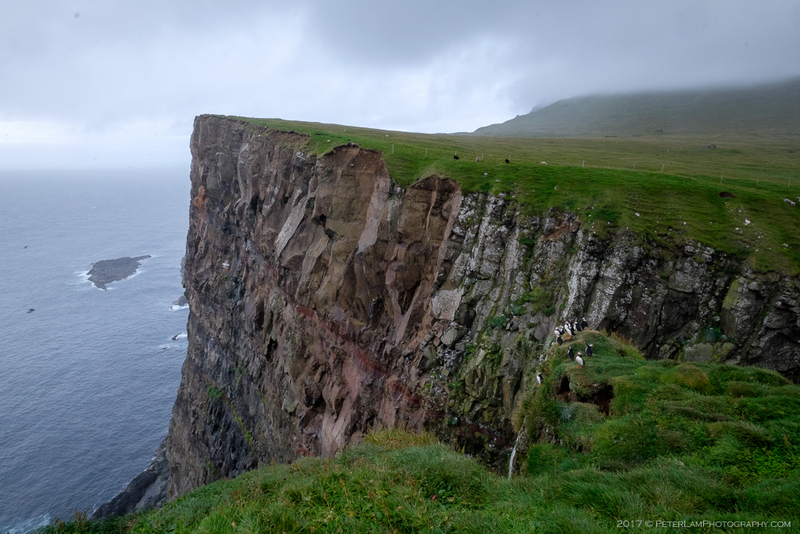 Dramatic rugged coastline of Mykines. Heading up to the precipice. 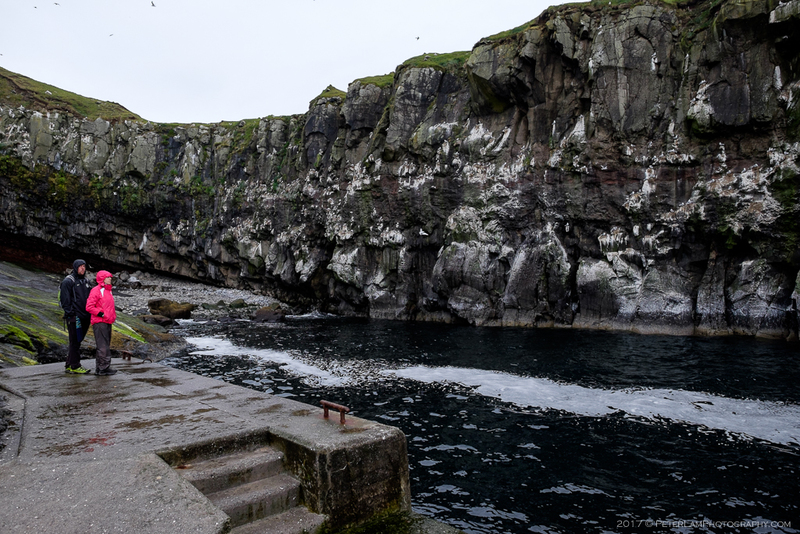 To the left, the islet of Mykineshólmur. 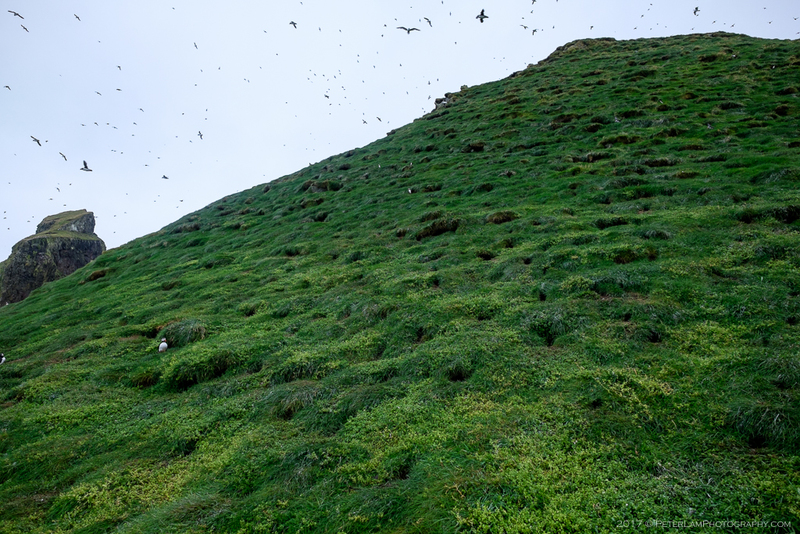 Hundreds of puffin burrows on the hillsides. If you listen closely, you can hear the young in the nests. This is what hiking is about. Glorious! 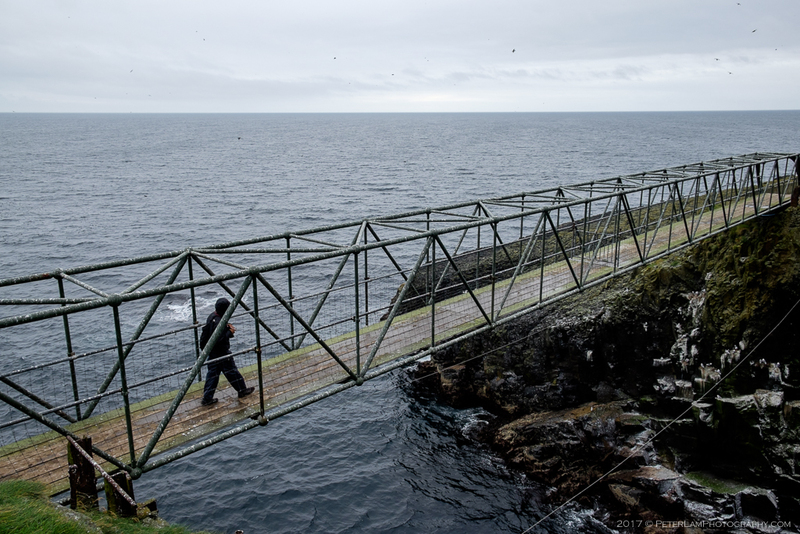 A 40m footbridge on the trail connecting to Mykineshólmur islet. 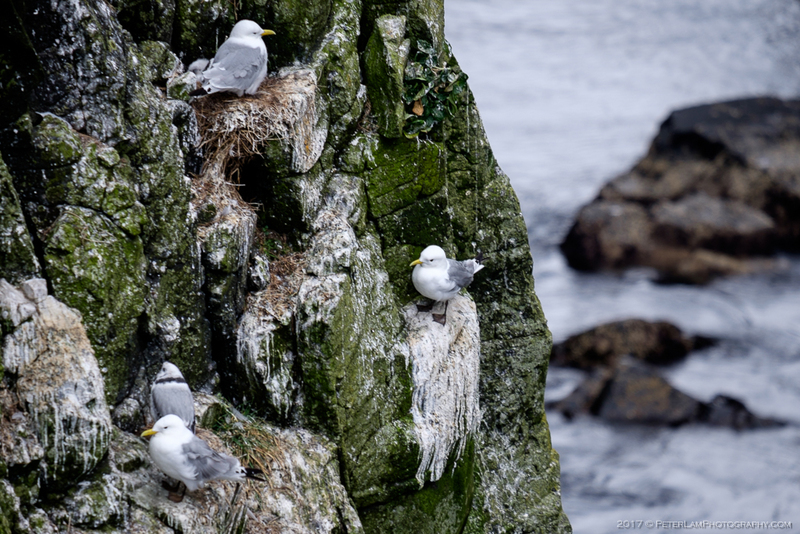 Seabirds nesting on the cliffsides. 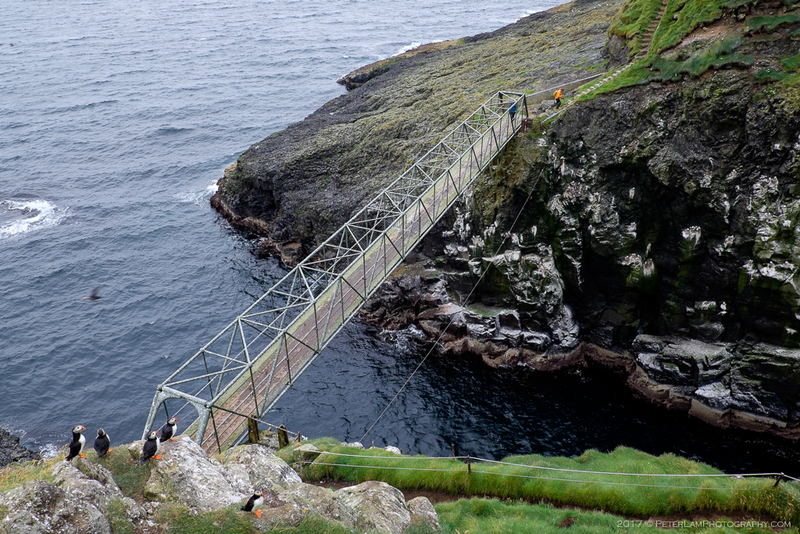 Cross the Atlantic Ocean on a bridge? Done! 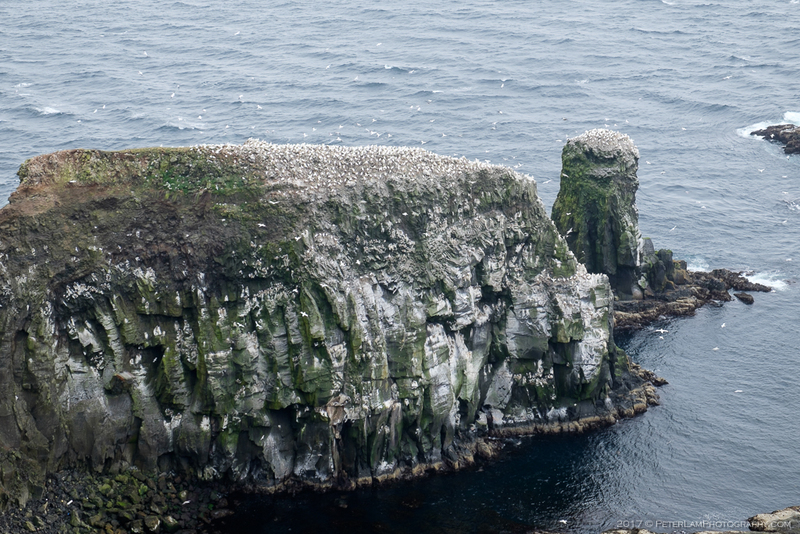 A gannet colony, the only one of its kind, on the western tip of Mykineshólmur. 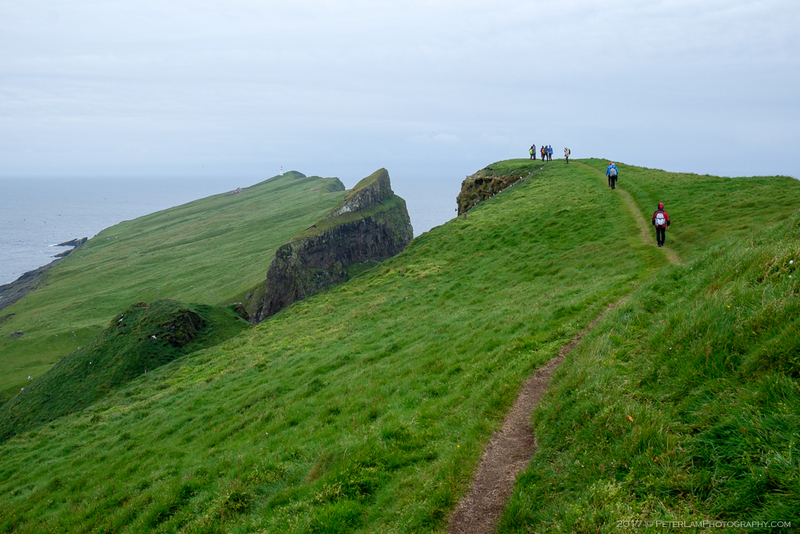 Reaching the lighthouse at the far end, we’ve now hiked to the most western point of the Faroe Islands. 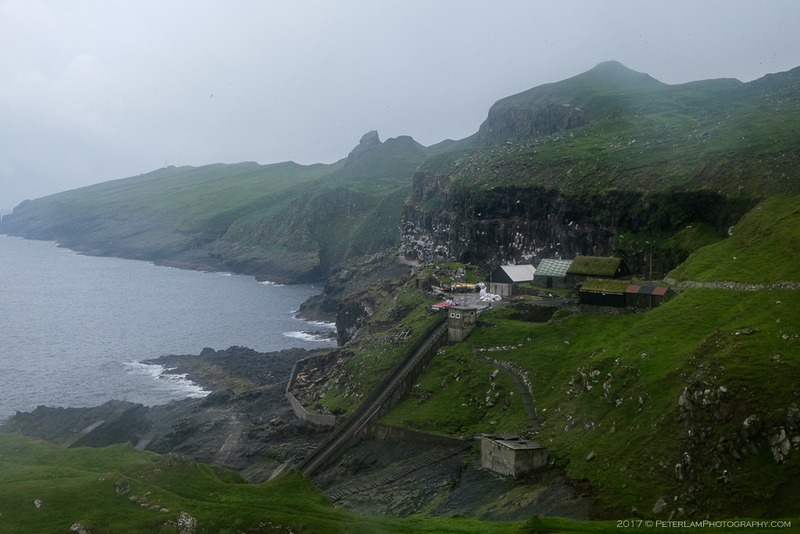 And just in time, the ocean welcomes us with driving rain and gusty winds in true Faroe fashion. 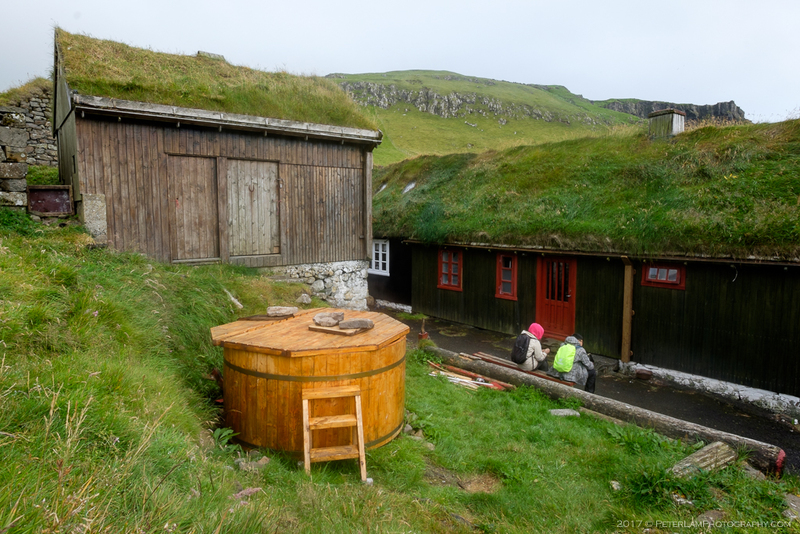 We enjoy our accomplishment for a few moments before heading back to Mykines village where – surprise! – the sun returns, at least for a moment. 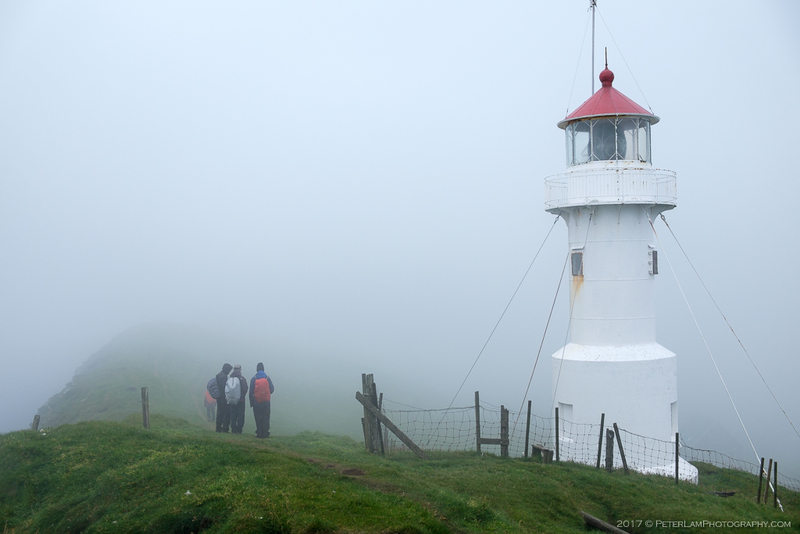 The lighthouse on Mykineshólmur, just as the storm rolls in. But back at the village, it’s sunny again. 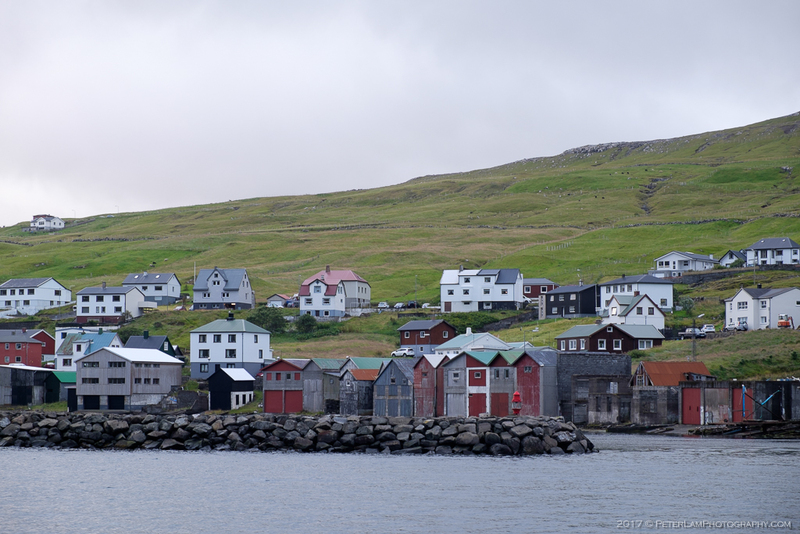 View of Mykines harbour and tourists waiting for the early afternoon ferry. 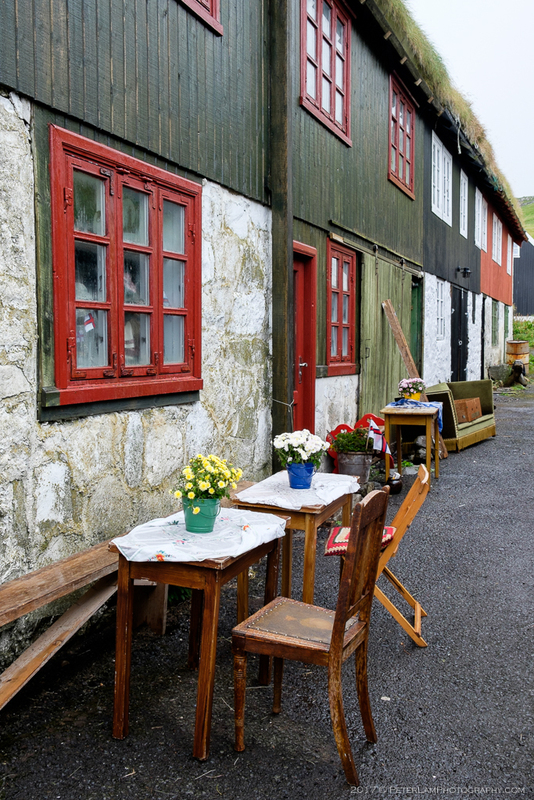 While waiting for our ferry ride back to the mainland (the last of the day), we took the opportunity to warm up at a local coffee shop and also explore the village. 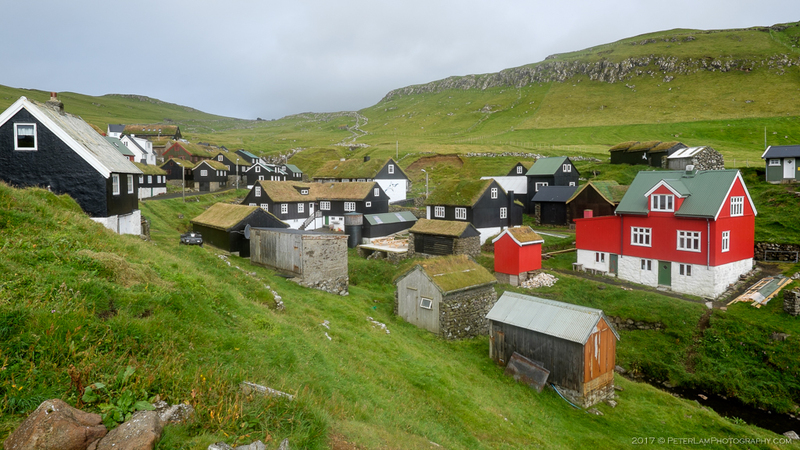 Mykines is a beautiful coastal settlement, typical of many Faroese villages with its bright colourful houses and traditional turf roofs. With a permanent population of just 20, the number increases during the summer months as some residents return to their vacation homes. 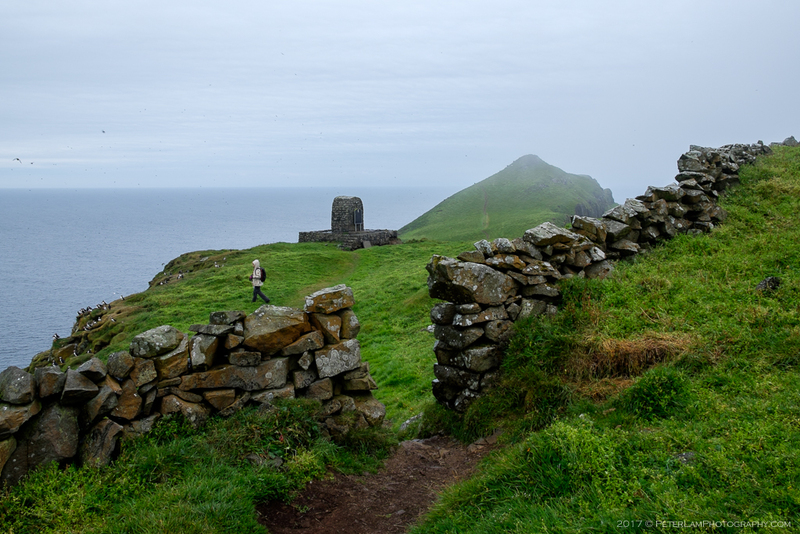 There are no roads on the island (since there are no cars) – only old footpaths that have been used for centuries. 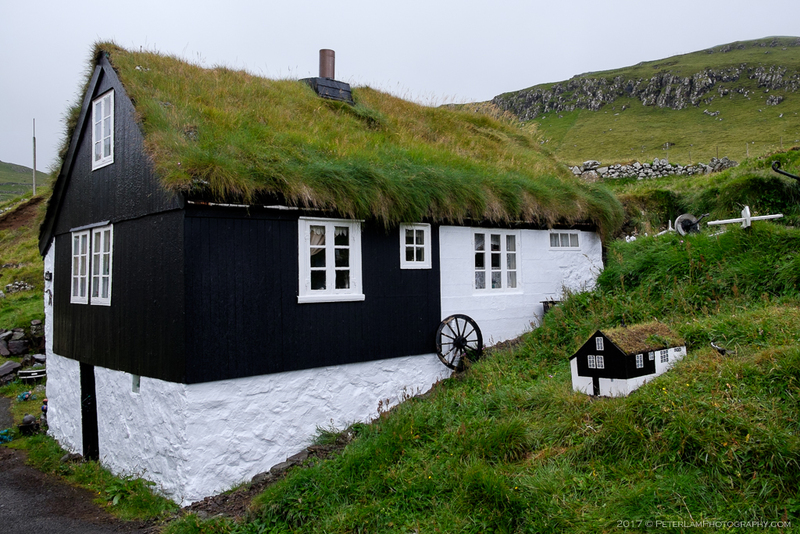 Commonly seen on the Faroes – a house, and its mini replica. Have a seat, take a break. A small stream runs through the village. Most houses are unoccupied but still feel like home. Some are summer vacation homes when conditions are less harsh. 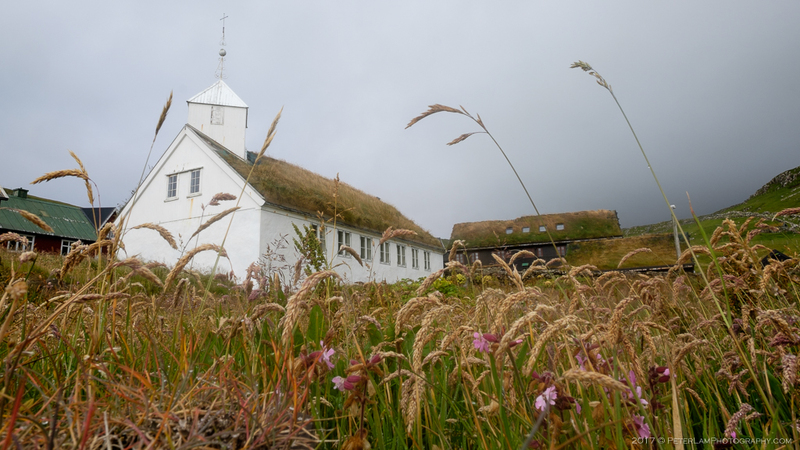 The village church dates from 1878. 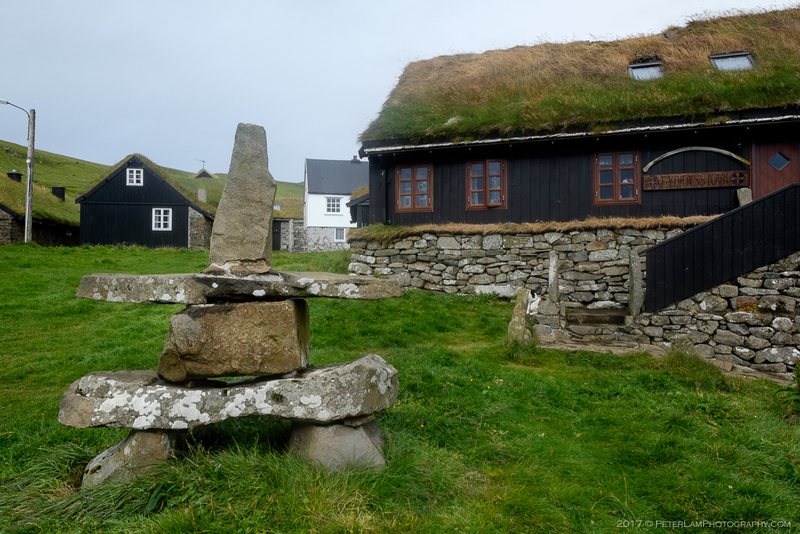 Inukshuk on the Faroe Islands? Outdoor hot tub. This is where the party is at! 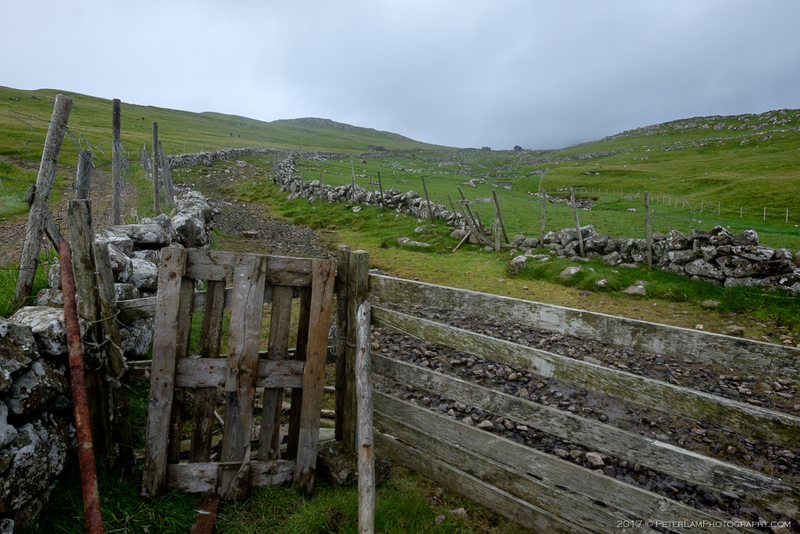 Further from the village, and old stone wall and gate to the outfield. 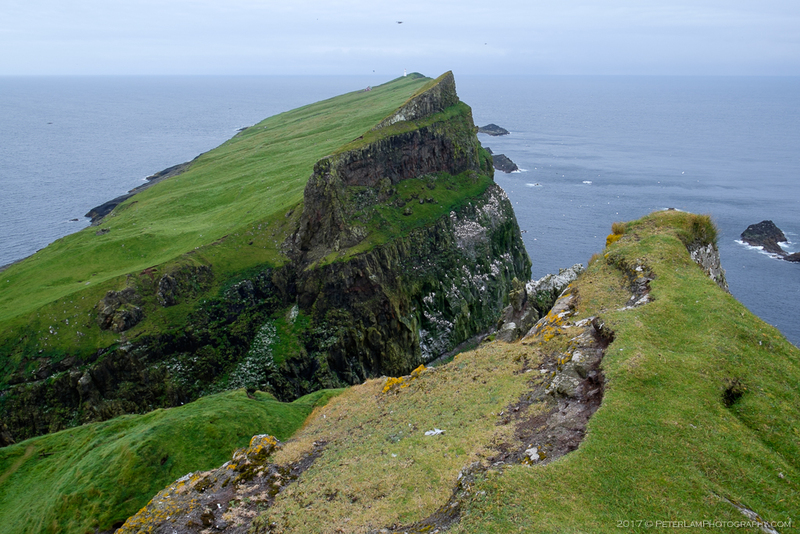 Precipitous cliffs north of the village. At the village harbour waiting for the ferry. A steep footpath leads up to the village. 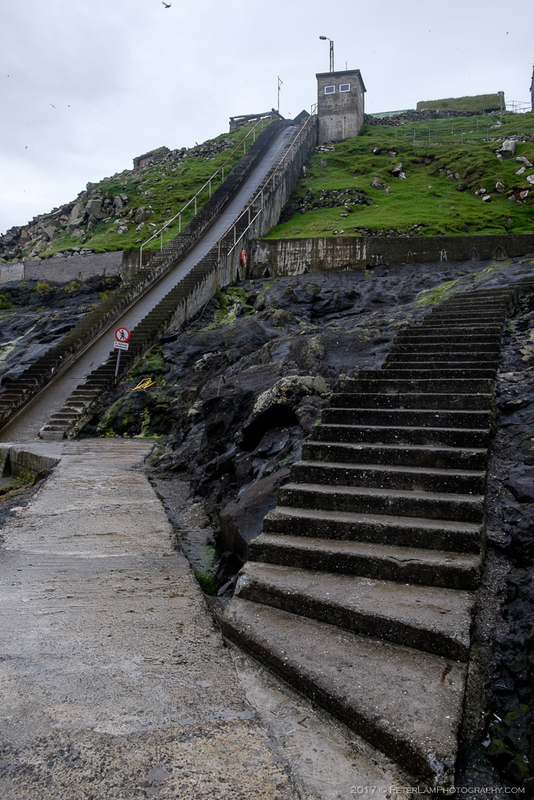 The funicular is used to transport goods up the hill. 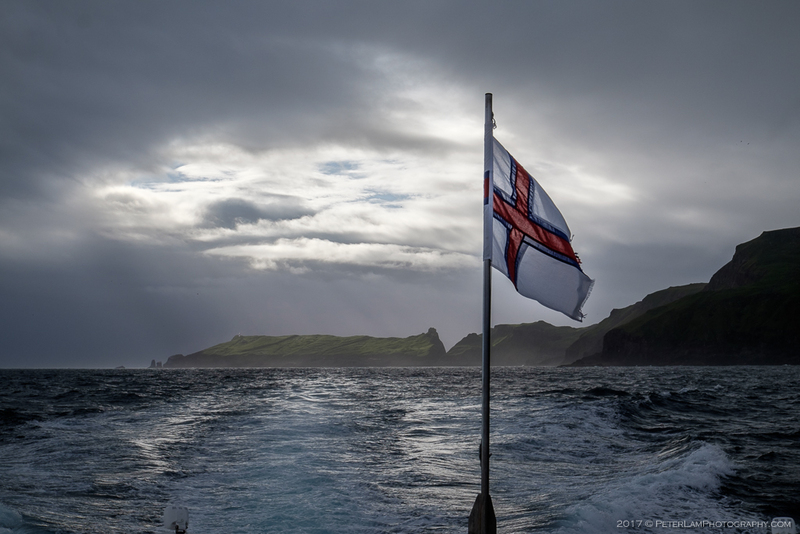 Our ferry arrives in the sheltered bay – pretty rough seas today. 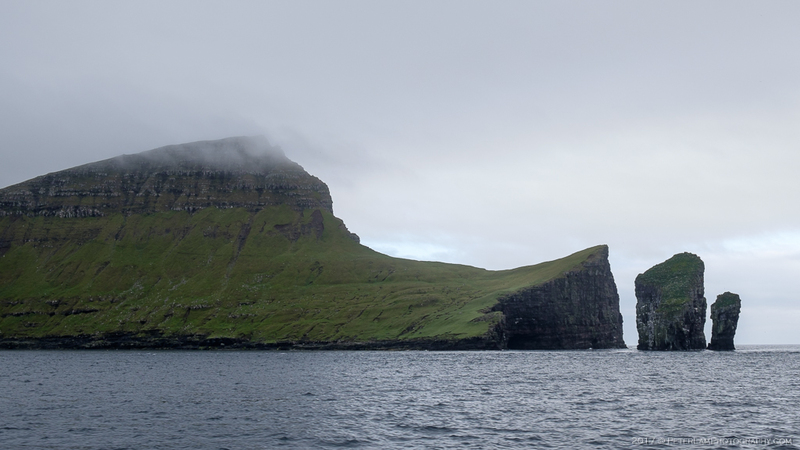 Once last look at this amazing place at the edge of the Faroes. 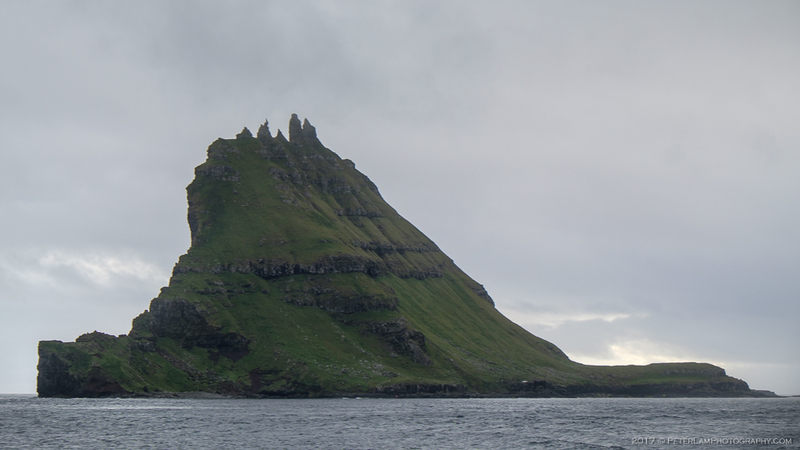 Impressive Tindhólmur islet with its five peaks. 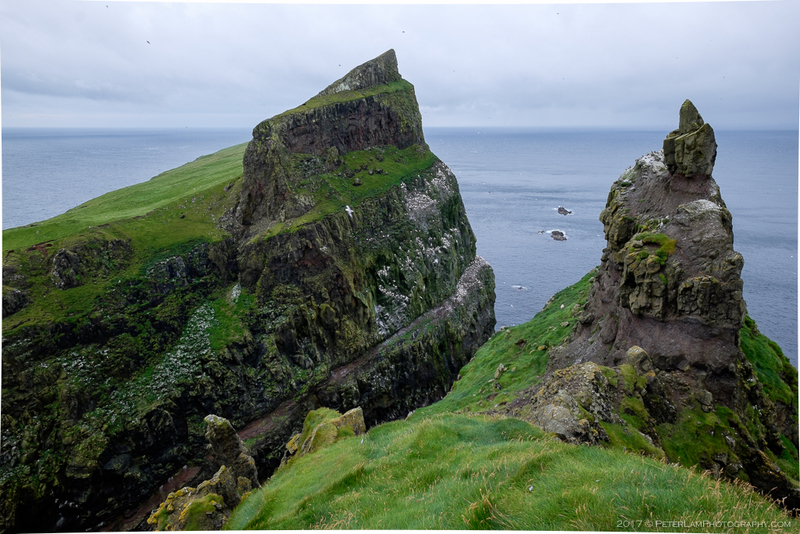 Sea stacks Stóri Drangur and Lítli Drangur, collectively Drangarnir, off Vágar island. 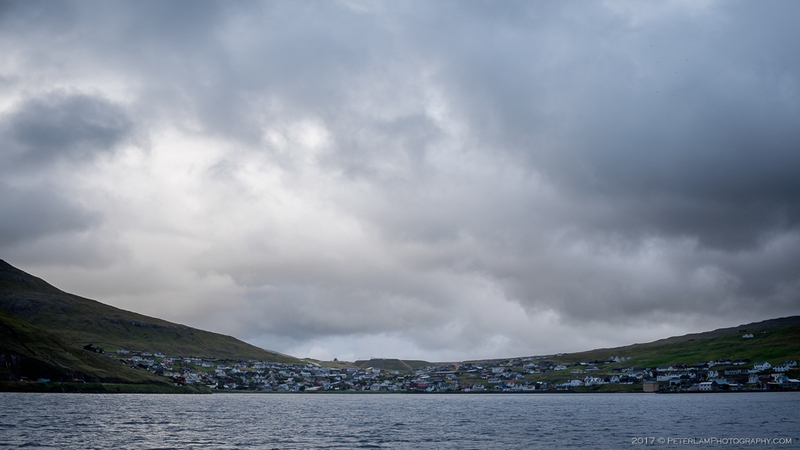 The village of Sørvágur, the ferry destination. Sørvágur harbour. 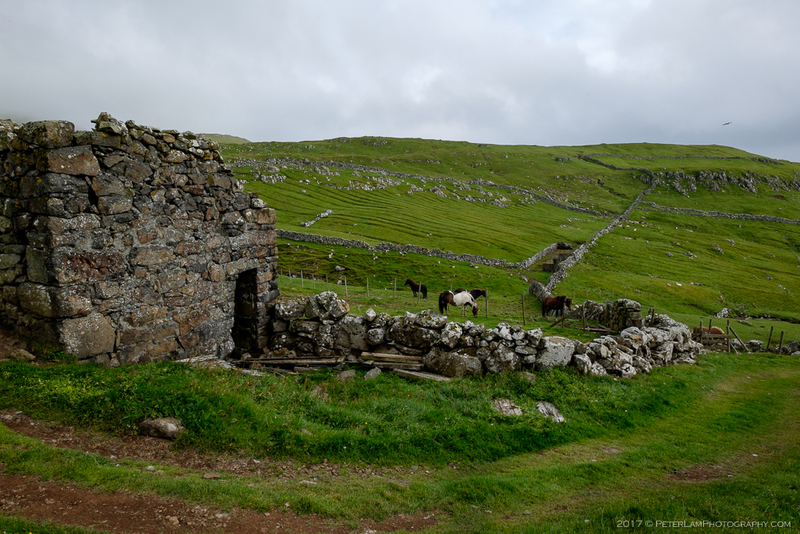 We hitched a ride back to Vágar airport, the origin of our day trip (and location of our car). I wanna go!!! Thanks for sharing! Great stuff! Can I ask you what site/app you use for location map? Thanks so much! 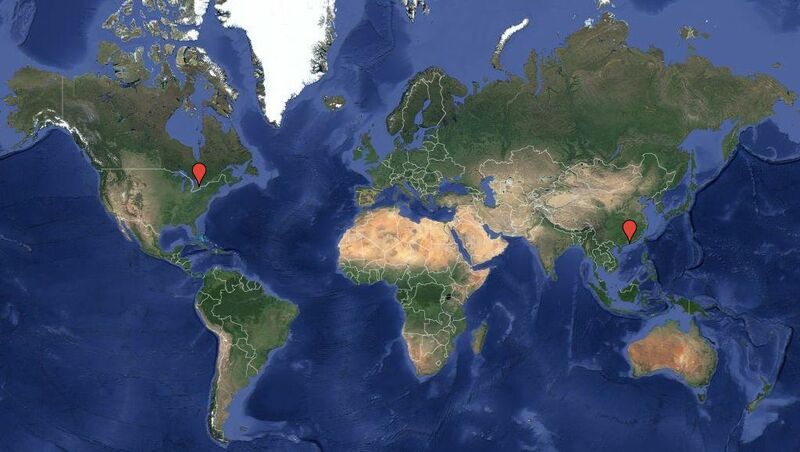 The locations are just Google Maps. Some are screenshots, others are embedded. Thank you. The maps you created are Great!